Contests - Frontierville Express - More Than Just A News Site: Hank's Easter Egg Hunt! Hank's decided to get into the Easter spirit by taking part in an Easter Egg hunt! 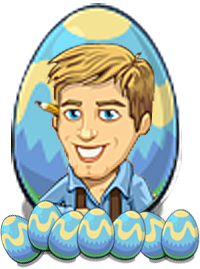 He's painted up and hidden 10 Eggs around the homestead and wants you to find them all for him for a chance to win 50 Dinners! Just click the picture below for a full size image and write the grid references of the 10 eggs you find in the form at the bottom of the page. Hank wants the square with the visible tip of the egg in. One lucky entrant picked at random will take home the 50 Dinners for 1500 energy points! Entries stay open until the END of Easter in the US... Midnight US PST, 3am US EST, 8am UK GMT and 5pm Australian Canberra Time. One entrant with the right answers will be picked by random selection using random.org and receive 50 Dinners.